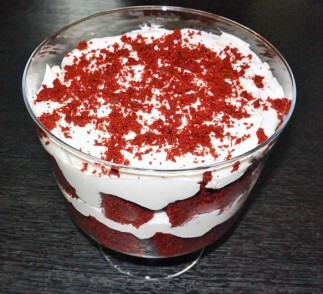 Moist, sweet and decadent, our gorgeous red velvet trifle is made with creamy VOSKOS Greek Yogurt and is the perfect Valentine’s Day dessert! Heat oven to 350 degrees F. Coat a 13 x 9 x2-inch pan with nonstick cooking spray. Cake: In a medium bowl, whisk together flour, cocoa, baking soda and salt. In a large bowl, beat butter until smooth. Beat in brown sugar until light colored and fluffy, 2 minutes. Beat in eggs, one at a time. On low, beat in half the flour mixture. Scrape down side of bowl and beat in yogurt mixture, followed by remaining half of the flour mixture. Stir in vanilla. Spread batter into prepared pan and bake at 350 degrees for 35 to 40 minutes, until toothpick inserted in center of cake comes out clean. Cool in pan on a wire rack for 10 minutes, then turn out onto rack and cool completely. Filling and topping: In a bowl, beat together cream cheese, butter and 3/4 cup of the heavy cream until smooth. 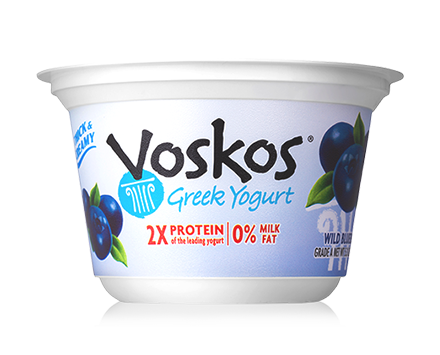 On low, beat in 2 cups of confectioners' sugar, the yogurt, milk and 1/2 teaspoon of the vanilla extract. Trim edges from cake and cut cake into 1 1/2-inch cubes (set aside 1 cube for topping). Place 1/3 of the cake cubes in a trifle dish or large bowl. Top with half the filling. Repeat layering with cake cubes and remaining filling, then top with remaining 1/3 of the cake. Beat remaining 3/4 cup heavy cream with remaining 2 tablespoon confectioners' sugar and 1/4 teaspoon vanilla. Crumble reserved cake cube over trifle. Cover with plastic and refrigerate overnight.